Applied Geographic Solutions » Surprise Shaking? Most Americans know fully well that the west coast, especially California, is subject to frequent and often severe earthquakes. Many would not be overly surprised if the ‘big one’ eventually caused Los Angeles or San Francisco to fall into the Pacific Ocean. Those of us who live on the west coast aren’t particularly keen on the idea, but hopefully most have prepared as best as possible for such an event. 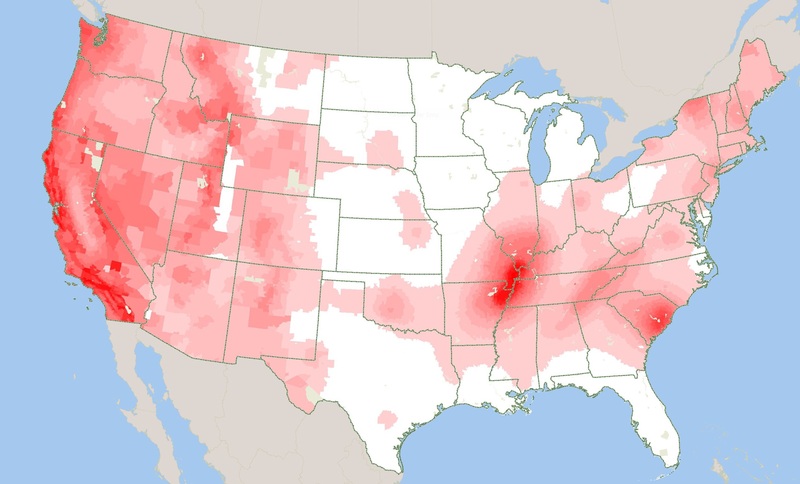 The map of the continental United States shown here presents the AGS estimated earthquake risk by block group. QuakeRisk is an index of relative risk (combining frequency and magnitude) of earthquakes based on many years of statistics. What many think should be a simple map turns out to contain some surprises. Note the major risk area along the Mississippi valley from the ‘New Madrid’ fault. This fault has the capability of producing a major earthquake and has done so in the past — a quake in the early 19th century was felt as far away as Washington DC! Note as well the riskier than average zones in the southeast and along the Saint Lawrence River valley. How many people would have guessed that Charleston, SC is at as high a risk for earthquakes as much of the Puget Sound area (Seattle-Tacoma)? An 8.0 quake would result in much, much more damage in Saint Louis or Memphis than would the equivalent quake along the San Andreas fault in California. Why? Because the building standards in California as they relate to seismic events are much more stringent than in Missouri or Tennessee, where buildings are much more likely to collapse, causing not only substantial monetary loss, but likely proportionately more loss of life. Want to avoid earthquakes as best as possible? We suggest Minnesota. For me, I’ll take the risk of earthquakes over cold and snow anytime. Copyright 2019 Applied Geographic Solutions, Inc. All Rights Reserved.